The 60-hour Alabama Real Estate Pre License Course helps you lay a solid foundation to start your real estate career. The course covers topics like contract law, listing agreements, real estate finance, closings, Alabama laws, and much more. The course will also prepare you for your state exam. You must complete an approved 60-hour course in order to sit for the state exam. The Alabama Exam Prep Course will provide additional preparation for your Alabama real estate exam by providing you with over 800 practice questions, including 15 practice quizzes and a simulated final exam. This isn’t required as part of the 60 hours of pre-licensing, but we highly recommend you utilize this course to prepare for your Alabama state exam. We also include our Mold, Radon and Home Inspection courses for Real Estate Salespersons. As a real estate professional, you will no doubt run into issues in all 3 of these areas when assisting your clients. These courses will give you a head start in your new real estate career. 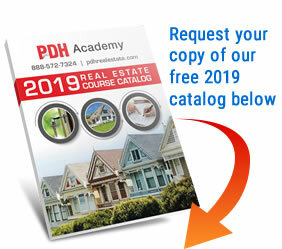 PDH Academy is approved by the Alabama Real Estate Commission to offer the 60-hour Real Estate Pre-License Course required to obtain a license. Click here to view our approval. This course is EXCELLENT! The self paced educational lessons along with the quizzes allowed me to receive my training without any disruption to my everyday life/work. It also allowed me to prepare for the State Exam and pass on the first attempt. Furthermore, having unlimited access to the material for future reference has helped me tremendously. I have often went back and reviewed lessons when I have encountered things on the job that I was uncertain of. I would highly recommend this course to anyone. Great course. Well set up explanation and pictures to detail. I’m glad that I chose this course. Thanks. I was very impressed with the course content. The program was easy to follow and provided an excellent format for learning. I am looking forward to putting what I learned to work in establishing a successful career. Being licensed in multiple states, I have taken other courses and several continuing education classes. This is by far one of the best I have taken. The way the information is explained makes it easy to understand. Course was easy to work through and very informative. Thank you for putting on an excellent course of instruction. The illustrations were very helpful and the lessons explained each and every situation in full detail. I went through this course in 12 days and I could not have done that if the class was not so well organized. Thank you. The course material and narrative was well thought through. It has given me a better understanding of what to look for in an inspection. The pictures and explanation was very good. I am looking forward to more training in radon, mold, meth, and etc. Thanks for putting together a great training program. This has been an exciting journey. ready to get started! Thanks PDH! The course was very well presented and learned a lot of unexpected information. This course will greatly help me to be the best real estate agent I can be. I’m now one step closer in life to be me. Do what I want, be my own boss. The world seems endless now. Thanks, for the knowledge you have provided me in my quest in being a real estate agent. The course was very good, very thorough. I’ve been in the business for 18 years, and I learned some new things in this course. It’s also nice to be able to go back to and review a session online. Excellent course, bypassed my expectations! I highly recommend it. I even recommend it to my older brother!. Thank you very much PDH! It was a great investment. I am glad I made the decision to take the PDH course. I can’t believe I’ve sold 5 properties in my first three months on the job! Really enjoyed the course and learned so much. Has great tools to help you along the way, very easy to use! The online course was unbelievably great. First time taking a course online so I did not know what to expect, but half way thru I called PDH and told them how impressed I was with their course and how much I enjoyed the education. Great course! well put together and very informative. This course was a lot to take in, at the same time being easy to get through. I have absolutely no background in any way of what I learned. It opened up my mind and I’m appreciative of that. Loved all that I’ve learned and look forward to succeeding and learning more. Eventually will open my own company. With all the knowledge I’ve gained this is now a reality and I look forward to all of the future challenges. Thank you PDH!! When can I apply for my Alabama salesperson’s license? How long do I have to complete my Alabama 60-Hour Pre License course? All students must complete their 60-Hour Pre License Course within 1 year from their start date. Are there any other requirements as part of the state application process? Do you offer any classroom Alabama real estate pre-licensing courses? No. We only offer the Salesperson pre-licensing courses online. We do not offer any classroom pre-licensing courses to obtain your Alabama real estate license. We find that most students prefer to complete their education on their computer, smartphone, or tablet. Do you provide me with a certificate of completion when I finish the pre-licensing course? Does your Alabama pre-licensing real estate course have a timer? No. Our 60-hour course does not have a timer. You just need to get through all of the sections at your own pace and pass the online final exam given at the end of the course. No worries, if you don’t pass the online final exam, you can retake it for free. Do you report my completed courses to the Alabama Real Estate Commission? Yes. Your completed course will be reported to the Alabama Real Estate Commission. Are you approved by the Alabama Real Estate Commission? Yes. Our school is approved by the Alabama Real Estate Commission to offer the 60 Hour Real Estate Pre License Course. You can view our approval letter here. After I complete my pre-licensing course, do I send my state Alabama real estate salesperson application to you? Are there any time constraints I should know about? You have 365 days to complete your 60 Hour Pre License Course from the date that you start. You must take the state licensing exam within 6 months of passing the Pre License Course. Finally, you must submit your application to the Alabama Real Estate Commission within 90 days of passing the state exam. Our Pass Guarantee is your assurance that if you do not pass your real estate licensing exam on your first attempt after completing our Exam Prep course, you will be reimbursed for the cost of your exam. See our policies for more information. The 2 e-books included are Principles of Real Estate Practice and the Real Estate Math Handbook. Principles of Real Estate Practice is a modern learning tool for the student preparing to enter the real estate business as a licensed professional. It contains the essentials of real estate law, principles, and practices taught in real estate schools and colleges across the country, including all those fundamentals that real estate educators, practicing professionals, national testing services, and state licensing officials agree are necessary for basic competence. Principles of Real Estate Practice is tailored to the needs of the pre-license student. It is designed to: make it easy for students to learn the material; prepare students for numerous career applications; stress practical rather than theoretical, skills and knowledge. The Real Estate Math Handbook gives solutions to the most common math problems faced by real estate professionals.